The leather doctor’s bag evolved from earlier wooden and leather chests and pocket cases for drugs and surgical equipment. As diagnostic instrumentation and procedures were developed in the late 1800s and early 1900s, doctors making house calls needed a reliable bag specially fitted with compartments to carry an increasing load of instruments and drug supplies. 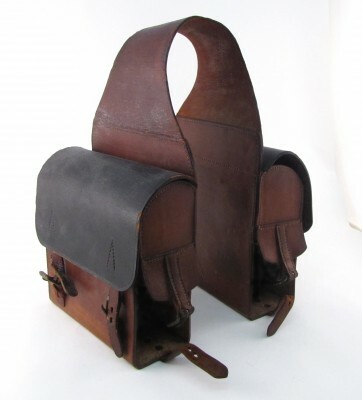 In the 1800s physicians answering rural emergencies on horseback draped medical/surgical saddle bags over the horse’s neck. Once a symbol of the family physician, medical bags disappeared when doctors stopped making regular house calls in the 1960s. These saddle bags were once owned by Dr. Frederick Banting, co-discoverer of insulin in 1921-2, but likely not used by him in his practice. The Museum of Health Care at Kingston is largely supported by gracious contributors like you. You can help preserve the historic legacy of Canada's only Health Care Museum by considering a donation or by becoming a member of our family. Your generosity helps to make possible public progrms, education programs, research, artefact preservation, exhibit development and more.